Blessed are they, who see beautiful things in humble places, where other people see nothing. I could never have supposed the power of art to create bonds with people--people who speak different languages or those with disabilities. Somehow it takes me by surprise every time. It makes me realize the untapped reservoir we have in all of us to create. When you work together doing art, there need not be spoken words. To sit and watch colors merge and mix, transforming into splendor, gives sparks to our brain. To see colors manifested in a glorious creation changes you; it makes you see beyond the horizon. There emerges a growing inner excitement to shape textures, colors, lights, and shadows that surround us. At first, our attempt to create is perhaps unsteady or dim, but then the light starts to shine through. We see before our eyes what we pictured in our head. Two artists, Tresa and a woman from Yemen,--from different parts of the world--creating together. No words. There doesn't have to be. 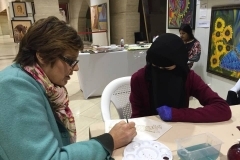 Recently Elias, my son with autism, met a remarkable Qatari artist and master teacher, Adel. We met him at the Fire Station gallery and museum here in Doha, Qatar. We wandered into his workshop, a sprawling, rambling space with two floors of wonder and awe--a toyshop for any emerging artist or anyone who wants to create. It is a laboratory of brimming creativity, waiting to experiment with and discover. You become just a little more alive when you enter his studio. You walk out feeling like someone has just injected you with reborn energy. More than anything, you feel enlivened and happy. It makes me think everyone should make a little space to create. As Pissarro, a favorite French Impressionist said about his workplace, "I am installed in a fairylike place. I don't know where to poke my head. Everything is superb, and I would like to do everything so I use up and squander lots of color.... "
If you roam around Adel's studio, you can see different objects from nature dragged in like logs, branches, and rocks. Wires and clay are ready to make a sculpture. Paintings, sketches, and large canvases cover the cement walls. There are areas where you can do printmaking, cut styrofoam into whimsical shapes, tarps with spray paints turned over on their side that just have a little more color in them. There are other areas where Adel works with many mediums--even mixing finger nail polish on glass. Upon entering, it might seem like clay, paint, paper, canvases, and boards are strewn around like a storm of chaos blew in. But as you wander, you begin to marvel. Your interest is piqued. You want to create the images that are floating around in your head. As we came in the workspace, Elias just wandered around the workshop saying, "Wow." Adel took him aside, and they began to make paint a large canvas with spray paint and markers. Few words were said--only the words, "slowly," "watch," "imagine," and "Can you see it?" Adel has been teaching art for many years, and is fascinated with teaching people with disabilities. As Elias slowly wandered around the spacious studio, Adel commented, "You see, he already knows how to create. He is not blocked like other people. For 24 years I have been trying to close my eyes to see the picture I want to create--to see it in my mind, and then capture it. He knows how to enter a zone that is special without me telling him how to go there." He then pointed to him, "You see he is thinking. Let him think." In another recent session together as Adel worked with Elias, he said with much adamance, 'We are family now because we do art together. Art is soft--not hard and clashing. There is no need for fighting and war with art. All peoples can come together. There need not be many words. We know what each other is saying." God gives us all the capacity to create. To view the enfolding creations of those around us, no matter how humble or different, opens our eyes to things as they really are. Our souls open up to each other. Creating unlocks the hidden crevices and pockets that are waiting to come out in all of us. You see. Creating makes everyone a little more happy.